Board presses are a great bench variant and should be a staple in any strength program. 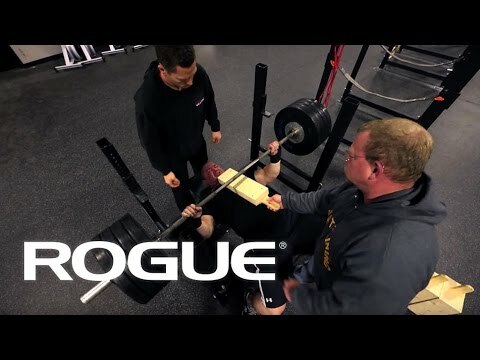 Rogue Board Press boards allow you to handle more weight, aka the Future Method. The different boards take you through different sticking points. Use a thicker board if you get stuck 3/4 of the way up to work through your lockout. Use a thinner board if you are weak off your chest. We decided to beef ours up and make it out of plywood. Plywood is much more solid than yellow pine 2x's! Board Press Thickness 1.5" 3" 4.5" 6" 7.5"
Rogue Board Press is rated 5.0 out of 5 by 8. Rated 5 out of 5 by kiltguy from It's a board! It's a Board. Nail/Glue plywood together. Shape handle, sand smooth. Does what boards do. Needs bigger hole in handle, so I can hang more chains/bands from it, so it's more Badass. I think they should color code them like the bands and plates, because saying it was a one board, or a 4 board, is lame (and for powerlifters). they should be more like "I hit 3 plates to a Blue board, for an AMRAP of 12" Really, it's a board. Why am I reviewing this? maybe so Rogue will send me a discount code for when I purchase more stuff in cool colors. Rated 5 out of 5 by John Mann from Great product, a nice tool for benching Awesome quality and perfect for building on weak areas on the bench. Highly recommended. Rated 5 out of 5 by Ben Podbielski from Well Worth The Money! I received a set of these as a gift and compared to the set I made from 2x4's is night and day. The handle perfectly size and the smooth edges make it much easier to hold onto. And the plywood seems to be holding up much better to the abuse of constant use compared to my 2x4's. Some people may not be able to see the cost justification over doing it yourself, but having used these for a while, it is well worth it! Rated 5 out of 5 by GP NW from Nice quality... I bought a few of these (1.5", 3.0", 4.5") to have 1.5"-7.5" heights covered, I have used up to two at a time. Rated 5 out of 5 by jmitch50 from Awesome addition to my home gym! I bought this a month ago and it has greatly approved my bench. Very easy to use and store away.